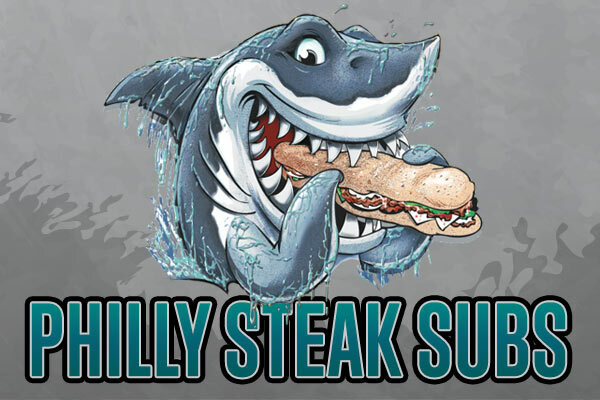 Philly Steak Subs menu is made-to-order and bagged to go, but don’t let this rush you out the door! Take a seat at one of our booths, high top tables, or bar stools. If you can’t seem to drag yourself off the beach or want to eat at home, order online or call-in to place your order ahead of time! Please specify with or without caramelized onions. Prices do not include fries. Prices do not include fries. Substitute Swiss, White American or Cheddar Cheese on any Hoagie. Must specify Lettuce, Tomato, Onions, Mayo — otherwise it will be plain! Wings served with your choice of Bleu Cheese or Ranch Dressing. Choose from Mild, Hot, Terriyaki or BBQ. Served with sautéed onions, green peppers, mushrooms, lettuce and tomatoes on the side so you can make it however you like! Choose up to 3 different cold hoagies from our menu. Toppings and condiments are served on the side so the whole group can dress up their hoagie however they choose.